The passing of each year is always a time to reflect on past achievements and failures, in equal measure, and consider what the next year holds. In mobile gaming we have a lot to be excited about in terms of creative possibilities and inspiration. The mobile game that excited us the most in 2011 was Superbrothers: Swords & Sworcery EP (S:S&S EP). The videogames news site, Kotaku, nominated S:S&S EP for ‘game of the year,’ featuring it among titles on the bigger platforms (Playstation, Xbox, etc.) and revered games such as Portal 2. This is a comforting symbol of smartphone gaming’s potential to rival the more powerful platforms in creating engaging and immersive gaming experiences. That S:S&S EP was designed from the ground up around an emotional experience is also a testament to a growing change in videogames and general maturing of the art form. [Note: you can can read about the development of S:S&S EP in Game Developer Magazine’s September issue, which is available free to read through the Game Developer app for iPhone and iPad]. Creating a game around an emotional experience is a significant step because the common development practice till now has been to design games around puzzle elements or gameplay, and technical unique selling points (cutting-edge graphics; destructible environments; realistic weaponry, etc.). Videogaming’s historic connections to board games and it’s technological foundations meant that such an approach was only natural and one that meets the expectations of it’s audience looking video-based-games. However the medium of videogames has much more to offer in terms of emotional experiences that can rival, if not, surpass those of traditional artistic media, such as fine art painting and music. The reason why we believe this to be so is because every videogame is fundamentally a mix of visual and audio elements that are directly related to their counterparts in the traditional arts. The range of emotions that traditional media are able to communicate to audiences can therefore also be created with videogames. What distinguishes games from traditional media is the element of interactivity; that the player has an active role in the artwork. 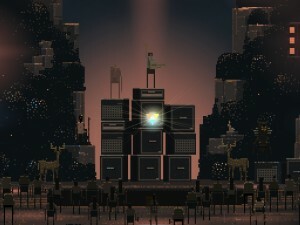 This collaboration between a game’s designers and players is why Superbrothers’ approach of developing Swords & Sworcery around an emotional experiences is a positive shift in game development practice that will open new possibilities for more meaningful artistic experiences that go beyond the limitations of videogaming’s roots. The question is no longer what type of game we want to create but what emotions we want players to feel. Mobile gaming is an exciting place to experience and influence this conceptual change because development doesn’t require big teams, and is cheaper and quicker than development of AAA-games. These traits mean there’s less risk and more freedom for the development team to explore new interaction mechanics using touch-sensitive user-interfaces, for instance. Another advantage is the accessibility of the platform, in that a larger and more varied number of people own smartphones and can potentially play a particular game. One such game that strongly involves players in co-creating the game experience through experimental mechanics is Dimensions. Similar in spirit to Gbanga’s own location-based platform, Dimensions offers a mixed-reality audio experience where players explore a dreamy soundscape that feeds elements from your real-world environment into the game. An aspect of the game that we particularly like is that the game is very passive, notifying you when special events occur, so you can enjoy the audio experience without having to worry about missing out on important in-game events. Widespread mobile gaming is still a relatively new phenomenon and one that faces an ongoing challenge concerning control mechanisms. Rockstar’s release of Grand Theft Auto 3 on iPhone, iPad and Android is an amazing technical achievement but a control system originally designed for the controller translated to a touch interface feels awkward for it’s lack of responsiveness and tangibility. In this respect, Smash Copslooks extremely promising for it’s innovative touch-controls and console-quality graphics. Created by a team of ex-Sony developers (one of which also worked on Burnout, which Smash Cops certainly pays tribute), it’ll be interesting to see how the control mechanics suggested in the game’s trailer play out in practice. With exciting game releases ahead and plenty of inspiration from current games, we’re looking forward to a creative year here at Gbanga. We have one or two new releases of our own to publish sometime in 2012 and look forward to applying our collective experiences to continue developing emotionally rich games mixed with reality. For a tantalising preview you’re welcome to download a cut-out character that we’re currently working on for an up-coming release: http://gbanga.com/2012.